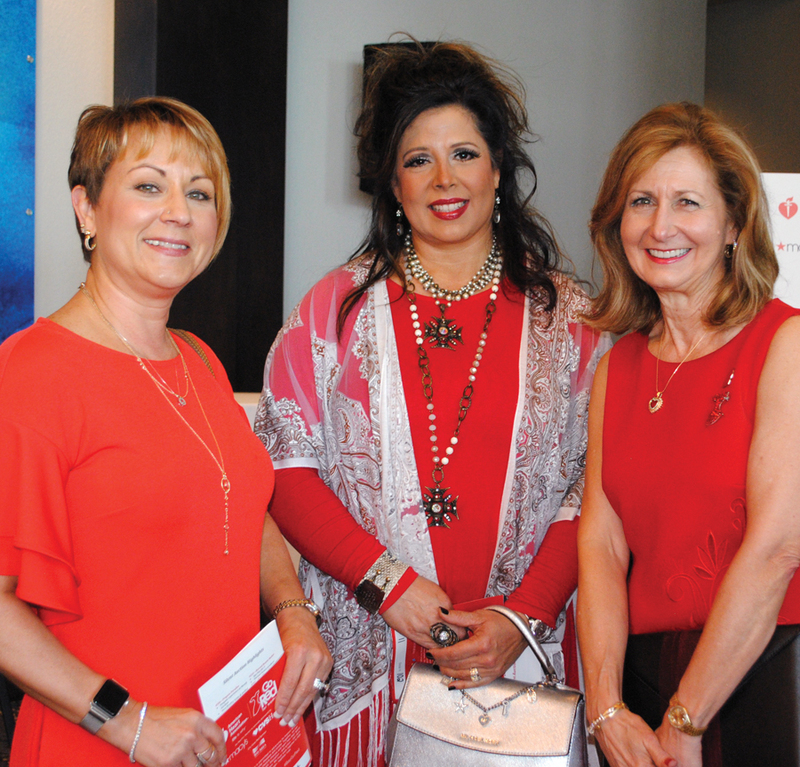 A BEAUTIFUL sea of red filled South Shore Harbour Resort’s Crystal Ballroom as hundreds of Bay Area women – fashionably dressed in red — and quite a few men, gathered to take up the American Heart Association’s fight against heart disease by raising $220,000. 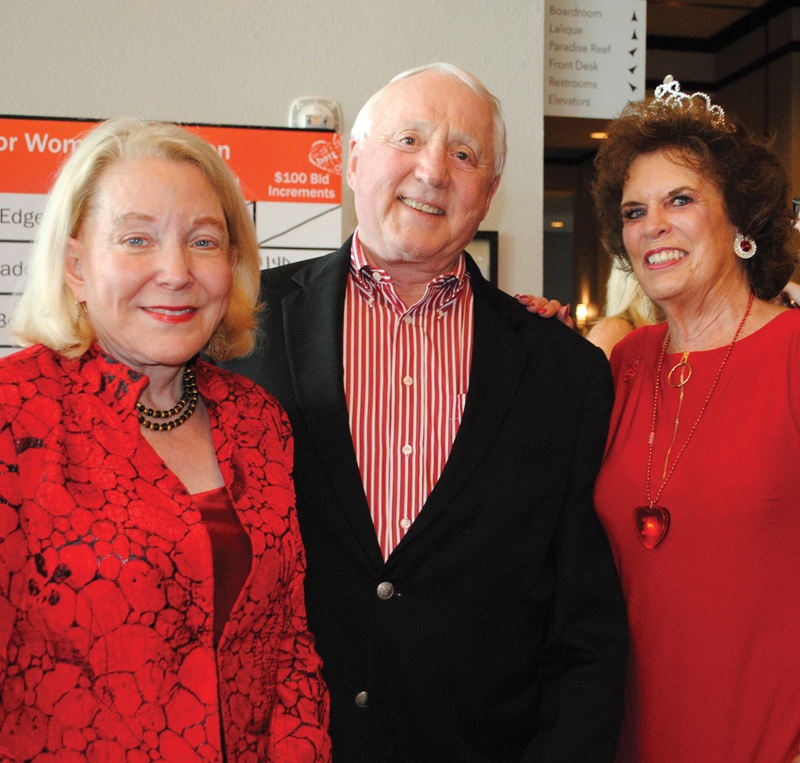 The occasion, of course, was the annual Bay Area Go Red for Women Luncheon, chaired this year by Loraine Lyons, who with her husband, Dr. Michael Lyons, joined Men Go Red For Women Co-Chairmen Jim Sweeney and Santiago Mendoza Jr. in welcoming some of the early arrivals – League City Mayor Pat Hallisey and his wife, Janice, Jana and Chris Reed, Pat and Wendell Wilson, Kristy Cormier, Colene Joiner, Sara Martin, Michelle Stoddard, Katie Pistone, Brooke Villanueva, Emmeline Dodd and Kenneth and Kristi Koncaba. Pretty Elissa Rivas of ABC Ch. 13 served as emcee of the “Survivors With Style” fashion show that featured models Sherri Grisham, Caroline Smith, Andrea McGhee, Amber Trueblood, Michele Metts, Barbara Welch, Carolann Peters, Veronica Wier and Kelli Reddinger showing off fashions from Macy’s while those who played key roles in making the day a success looked on – Circle of Red Co-Chairmen Darcy Whatley and Tama Brantley McEwen, plus Gloria Greene, Tamara Ostermayer, Marilyn Sims and Theressa Riggs, to name a few. Emmeline Dodd, right, walks into South Shore Harbour Resort to find Pat and Wendell Wilson at the Luncheon. Others included Heart Throb Chairman Sandy Adams, Open Your Heart Chairman Fay Picard, Auction Chairman Laurie Dahse and Fashion Show Chairman Stephanie Rice and their committee members – Meloney Bean, Abbie Contreras, Amanda Fenwick, Brandy Gates, Hilary Hart, Donna Orozco, Tamara Ostermayer, Teresa Provis, Kelli Reddinger, Nancy Suarez and Elizabeth Quigley. The event came to a lively close with the showstopper – the annual Heart Throb of the Year Competition featuring Dr. Jason Gukhool, representing Elite Care 24 Hour Emergency Room– League City; Jonathan Bender and James Blasczyk, representing Bay Area Regional Medical Center; and Chris Reed, representing All American Orthopedic and Sports Medicine Institute. After an exciting vote by the audience, Chris Reed emerged the winner, taking home the Heart Throb of the Year Award, sponsored by Texan Bank. Almost all the area’s medical facilities helped sponsor the event, including Bay Area Regional Medical Center, UTMB-Health, Memorial Hermann Southeast Hospital, Kindred Hospital Clear Lake, Elite Care 24-Hour Emergency Room of League City, U.S. Anesthesia Partners, All American Orthopedic & Sports Medicine, Chi St. Luke’s Health, Cornerstone Hospital, Pam Rehabilitation Hospital of Clear Lake, Baywood Crossing Rehabilitation and AMED Medical. Along with Moody National Bank, Norman Frede Chevrolet, BB&T, Texan Bank, ABC Ch. 13, Bay Area Houston Magazine, Leidos Women’s Network and Big League Dreams. The Clydesdales draw cheers from the Mount Belvieu crowd. CONGRATULATIONS to Michael and Ann Wismer Landolt and Jim and Tonya Ferris on their beautiful new Wismer Distributing facility that just opened in Mount Belvieu. 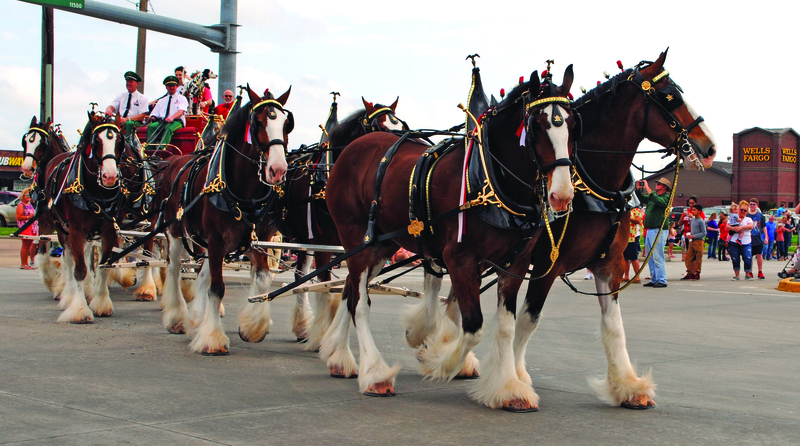 Had quite a celebration the other day with the Budweiser Clydesdales, the iconic Dalmation and members of the Baytown Rotary Club taking part in the parade through town and grand opening festivities at Mount Belvieu City Hall. Speakers included Chambers County Judge Jimmy Sylvia, Harris County Precinct 3 Judge Don Coffey and Mount Belvieu Mayor Nick Dixon as hundreds gathered to celebrate. BAY AREA MUSEUM Guild members were in for quite a treat when HEB hosted a complimentary Wine Tasting at the museum for members. Jan Larson served as chairman for the event, which drew quite a crowd, including Jack and Marcy Fryday, Peter and Pam Culpepper Cronk, Mary Ann Shallberg, Beverly Giacone, Donnie Johnson, Linda and Rich Steber, Lisa and Manuel Clobanu, Ava Galt. Leo and Rose Marie Symmank, Barbara Spencer, Kathy Herman and Sandi Allbritton, to name a few. A variety of hors d’oeuvres and cheeses that match up perfectly with the type of wine served delighted one and all, who really enjoyed the evening.